ITSCtruss can provide you a smart and unforgetable performance with the help of the high quality equipments: circle events trussing,stage lighting, aluminum trussing arc roof, sound and other effects which will enhance your shows. 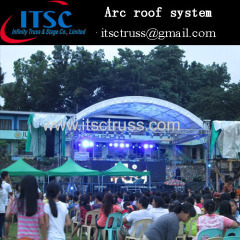 This arc roof system is special designed by ITSCtruss in the outdoor events. Indoor and outdoor hotel, school shows and other performance. Other size for trussing options: 200x200mm, 290x290mm, 300x300mm, 390x390mm, 400x400mm,450x450mm, 520x520mm, 600x500mm, 520x760mm,600x760mm, 1100x600mm, other special sizes can be customized. All our trussing is calculated in millimeter and meters, inches and feet is also acceptable. 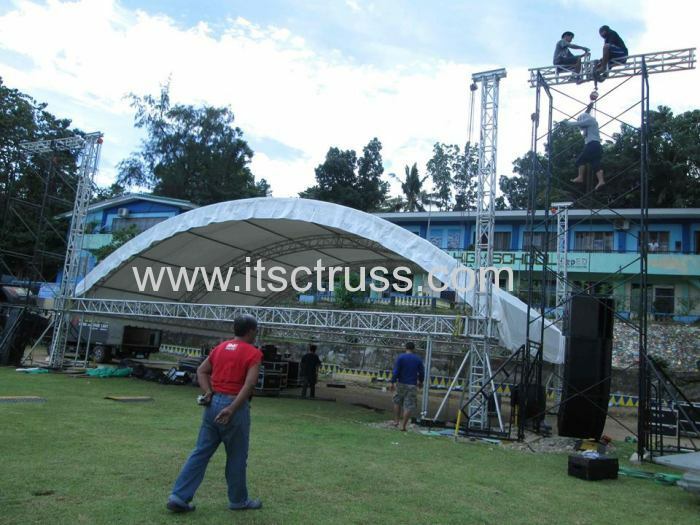 Diversal designs can be designed by ITSCtruss to hang acoustics, lound speakers and lighting. Usualy 30% in advance, and balance on the delivery. It just take around 2 hours to finish setup. Light weight and heavy duty capacity for hanging the stage equipments. Recyclable and environmentally friendly,ideal for your events. 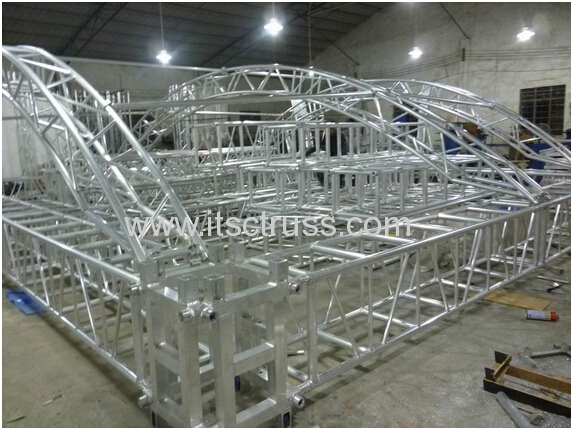 We do recommend you to ship the whole system in a 20GP container, which can save much of your cost and keep the products safe.It takes around 10 days-30 days to reach your port.Door to door service is also available for most of countries and districts.For more information, please contact ITSCtruss team and we will reply to your inquiry within 12 hours. The circle events trussing is finished by factory and now being tested before delivery. The people is constructing the trussing system for shows.